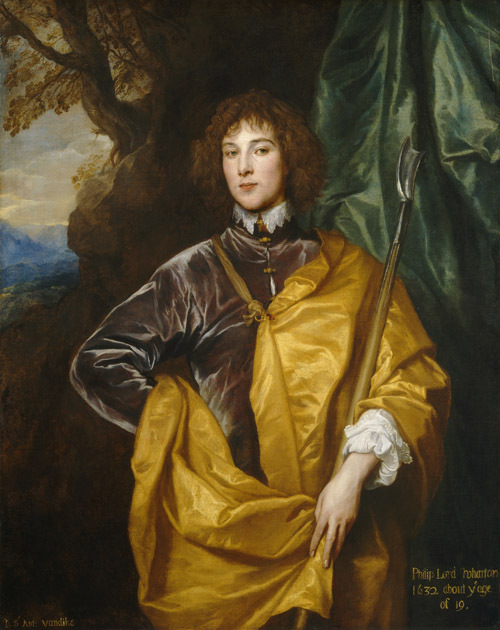 Sir Anthony van Dyck (1599 – 1641) Philip, The 4th Lord Wharton, aged 19. 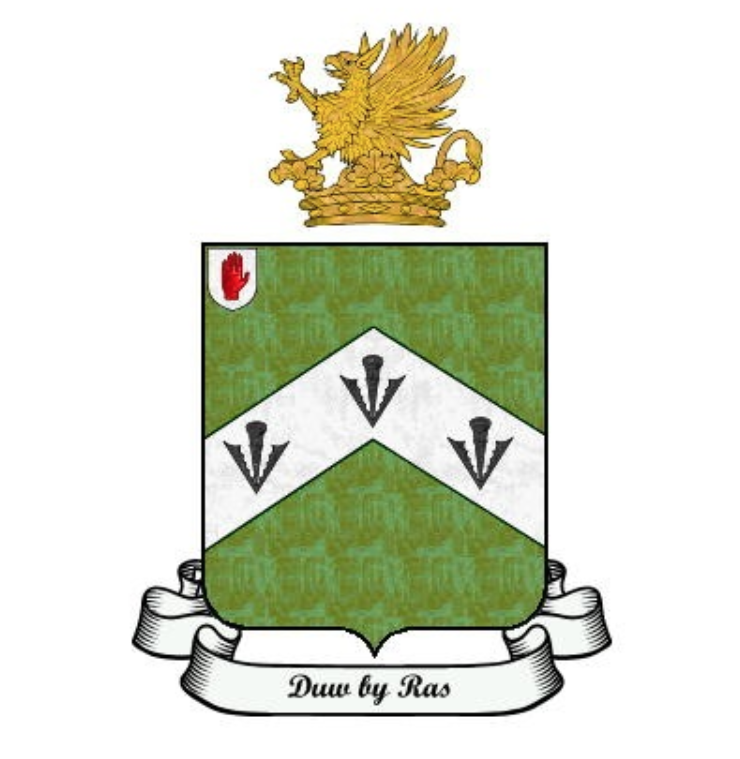 The Wharton Barony passed into the Kemeys-Tynte family in 1916 due to the seventeenth-century marriage of the Hon. Mary Wharton (d.1699) and Sir Charles Kemeys, 3rd Bt. (d. 1702). Hon. Mary Wharton was the daughter of the 4th Baron, and aunt to the 1st Marquess of Wharton. The 2nd Marquess and 1st Duke of Wharton was a colourful character who due to his spendthrift character and Jacobite loyalties was deemed an outlaw and his titles were proclaimed forfeit in 1729. Though his sister Jane Wharton, 7th Baroness Wharton (1706–1761) became his sole heir in 1739 and held onto this older family title, on her death the title went into abeyance. It was only to be revived in 1916 by Charles Kemeys-Tynte (1876–1934) petitioning the House of Lords that the title could in fact pass through the female line, and therefore pass to the last prime descendent of the Whartons, via Hon. Mary Wharton, which was himself. 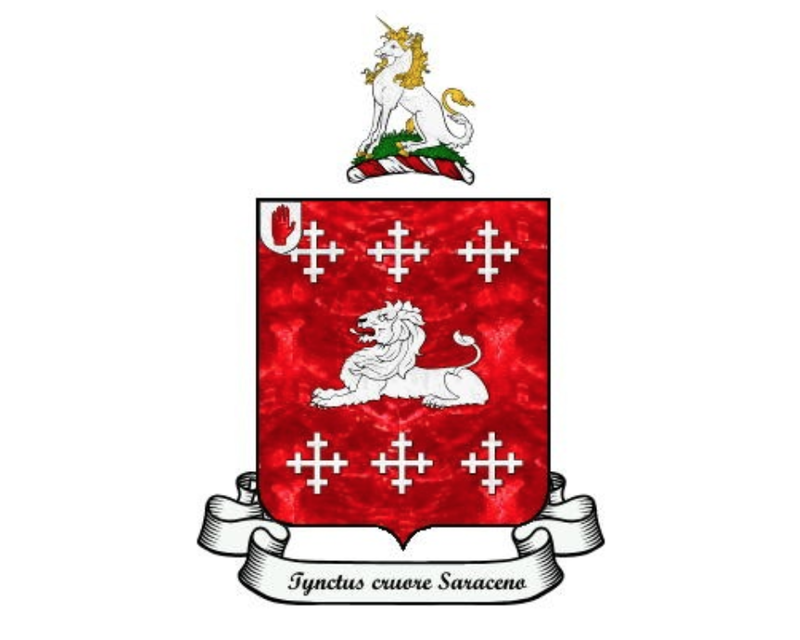 The Wharton knighthood dates from 6 October 1292 when King Edward I granted to Gilbert de Querton “the Manor of Querton with its appurtenances.” (“Querton” was the earlier Latin spelling of “Wharton”) There de Querton built Lammerside for himself and his wife, Emma de Hastings. (The remains of the building still stand and today resemble a pele tower). Emma was the daughter of Nicholas de Hastings of the family which were the ancestors of the present Earls of Huntingdon and of Pembroke. Baron Wharton is a title in the Peerage of England. It was created in 1544 by letters patent for Sir Thomas Wharton, who had previously served as a Member of Parliamentfor Cumberland. The fifth Baron, also named Thomas, had a long and distinguished political career, serving at various times as Member of Parliament, Lord Lieutenant of Oxford and Buckingham, Lord Lieutenant of Ireland and Lord Privy Seal. He gained several peerage titles, including: Marquess of Catherlough, Marquess of Wharton, Marquess of Malmesbury, Earl of Wharton, Earl of Rathfarnham, Viscount Winchendon and Baron Trim. His son Philip was made Duke of Wharton, but the title was later forfeit when the Duke of Wharton was declared an outlaw, while his titles he inherited from his father became extinct upon his death. 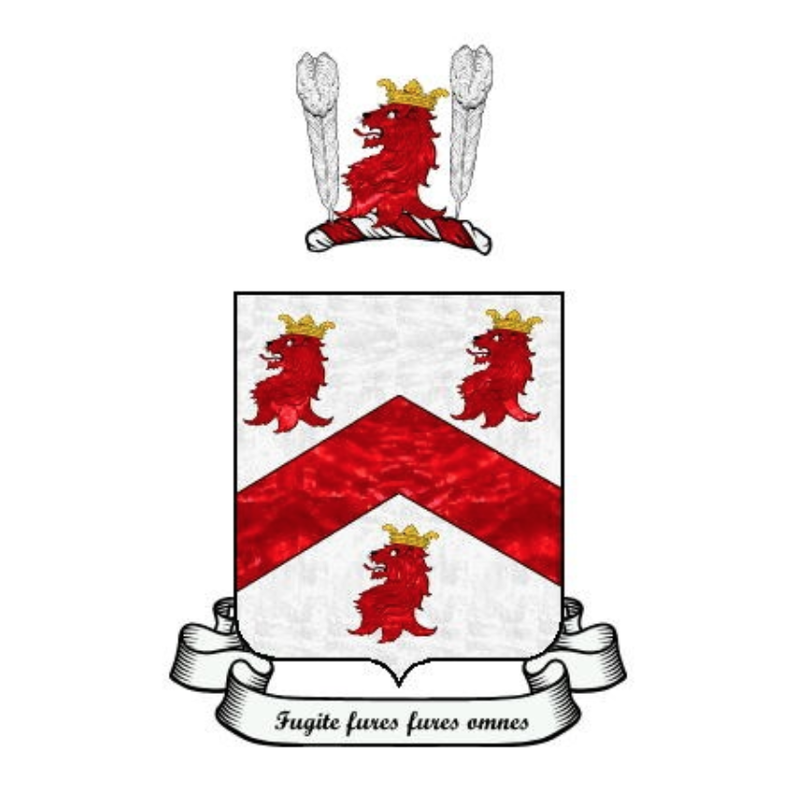 The oldest title, the Barony of Wharton, appears to have been successfully retained and used by the Duke’s sister, Jane Wharton, 7th Baroness Wharton (1706-1761) and the title went into abeyance on her death in 1761. In 1844, however, the Barony was claimed by the Wharton descendent Colonel Charles Kemeys-Tynte, and, since the document creating the peerage had been lost, the Committee for Privileges of the House of Lords ruled erroneously that the Barony was created by writ and could therefore be passed down through the female line. As a consequence of their resolution, it was determined that at the death of the Duke of Wharton, the Barony had fallen into abeyance between the Duke’s sisters, Lady Jane Holt and Lady Lucy Morice. It was further determined that, at Lady Lucy’s death in 1739, Lady Jane (by now Lady Jane Coke) remained the sole heir, and had been therefore entitled to the Barony. Finally, it was determined that at her death the Barony again fell into abeyance, where it remained in the nineteenth century. The Committee for Privileges, however, also ruled that it did not have the authority to terminate the abeyance because of the existence of a judgement of outlawry against the Duke of Wharton. Thus the matter remained unresolved for 72 years. 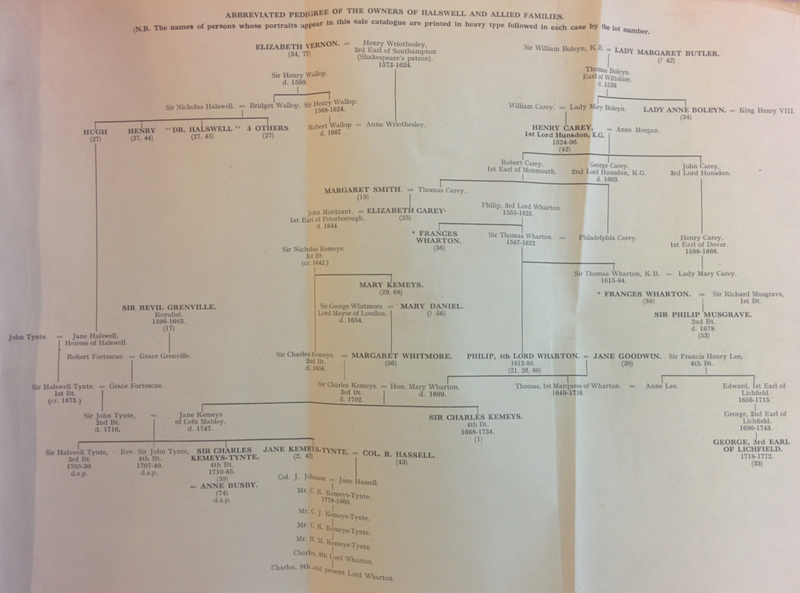 In 1916, the Sovereign terminated the abeyance in favour of one of Charles Kemys-Tynte’s descendants, who was also named Charles. 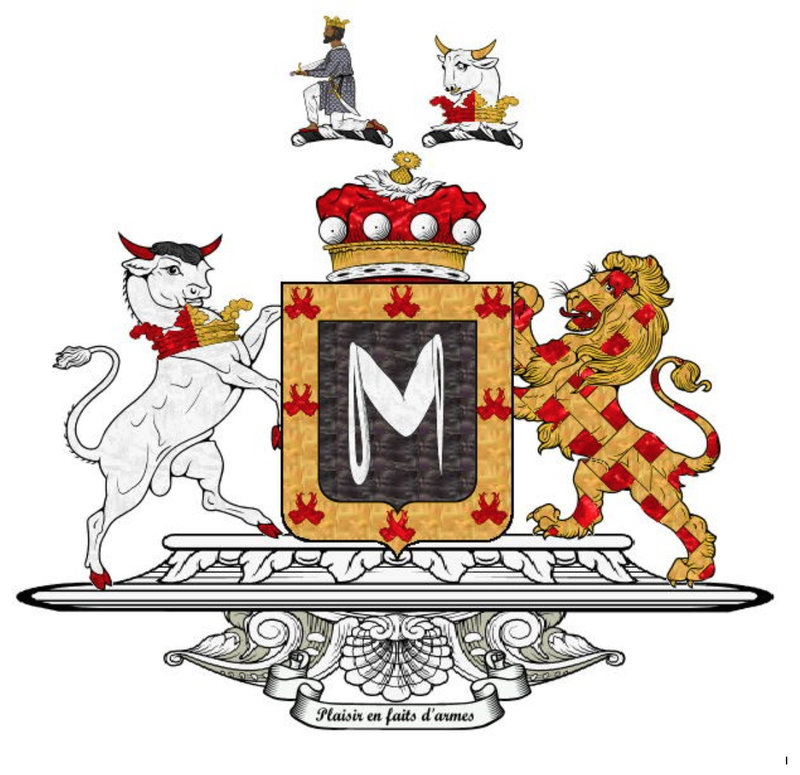 At this baron’s death, the title was inherited by his daughter Elisabeth, who became the tenth holder of the barony. At her death in 1974, the barony again fell into abeyance. It was once again revived in 1990, when the abeyance was terminated in favour of Myrtle Robertson. At her death, the barony was inherited by her son Myles. Jane Kemeys (d. 1747), married Sir John Tynte, 2nd Baronet (1683-1710). 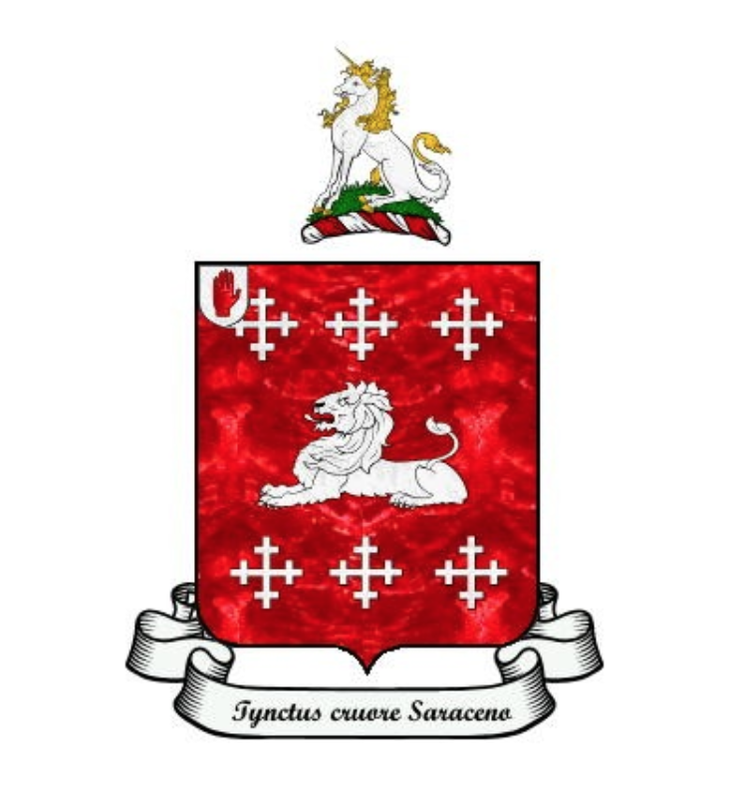 Their 3 sons, the 3rd, 4th and 5th baronets all died without issue, rendering the Tynte baronetcy extinct. Sir Charles Kemys Tynte, 5th Baronet (1710 –1785) MP for Monmouth 1745–47 and Somerset 1747–74. 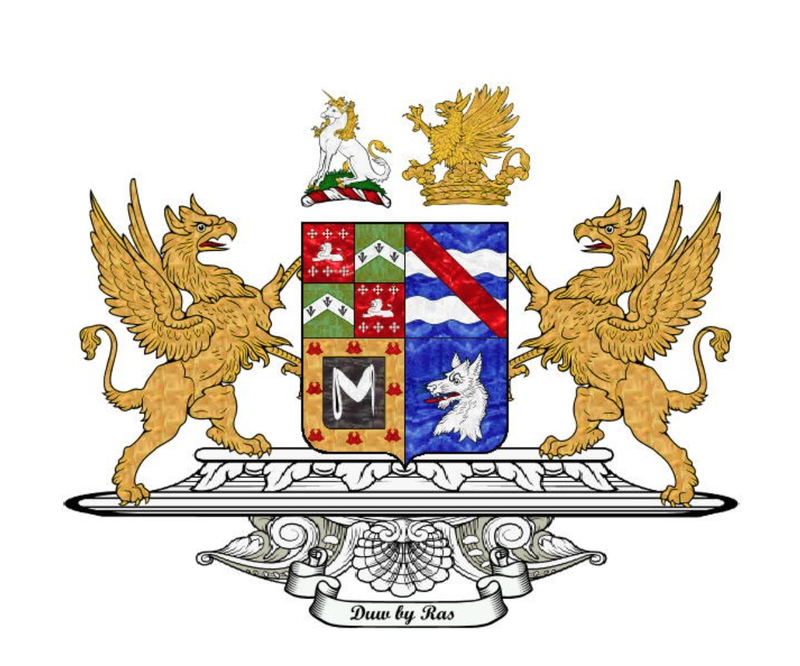 Sir Charles added the name ‘Kemeys’ to his own in 1747 upon inheriting the Kevan Mabley estate in Wales from his mother, Lady Tynte (née Jane Kemeys). Sir Charles’ sister, Jane Tynte, had married Major Ruishe Hassell but died in 1741 leaving two daughters, one of whom died in 1744, the second was Jane Hassell (1738-1824). Jane Hassell (1738-1824). Sir Charles died without issue in 1785 and the estates passed to this niece Jane Hassel who had been orphaned in 1749 and brought up at Halswell. The dowager Lady Tynte continued to live at Halswell until her death in 1798, however the estates passed directly from Sir Charles to Jane Hassell and her husband Col. John Johnson (m. 1765) upon his death in 1785. Philip Wharton, 1st Duke of Wharton, 2nd Marquess of Wharton, 6th Baron Wharton, 1st Duke of Northumberland, Marquess of Woburn, Earl of Malmesbury and Viscount Winchendon KG [Jacobite] (1698–1731) forfeit 1729. Jane Wharton, 7th Baroness Wharton (1706–1761) daughter of 1st Marquess of Wharton. Charles Theodore Halswell Kemeys-Tynte, 8th Baron Wharton (1876–1934) (abeyance terminated 1916) 1st son of Captain Halswell Milborne Kemeys-Tynte of Halswell, 1st son of Col Charles Kemeys Kemeys-Tynte of Halswell, 1st son of Col Charles John Kemeys-Tynte of Halswell, only son of Col Charles Kemeys Kemeys-Tynt, of Halswell, only son of Col John Johnson later Kemeys-Tynte, Groom of the Bedchamber, by his wife Jane Hassell, only daughter of Major Ruisshe Hassell, by his wife Jane Tynte, only daughter of Sir John Tynte, 2nd Bt., of Halswell (and sister and hrss. of Sir Charles Tynte, 5th Bt. MP), by his wife Jane Kemeys, only daughter of Sir Charles Kemeys, 3rd Bt., (and sister and hrss. of Sir Charles Kemeys, 4th Bt. MP), by his first wife Hon Mary Wharton, 2nd daughter by his second wife of Philip Wharton, 4th Baron Wharton. Sir John Tynte, 2nd Baronet (1683–1710) married Jane Kemeys, daughter of Sir Charles Kemeys, 3rd Baronet. Sir Charles Kemeys, 3rd Baronet (1651–1702) married the Hon Mary Wharton, daughter of 4th Baron Wharton. Thomas Wharton, 1st Marquess of Wharton PC (August 1648 – 12 April 1715) was an English nobleman and politician. A man of great charm and political ability, he was also notorious for his debauched lifestyle. 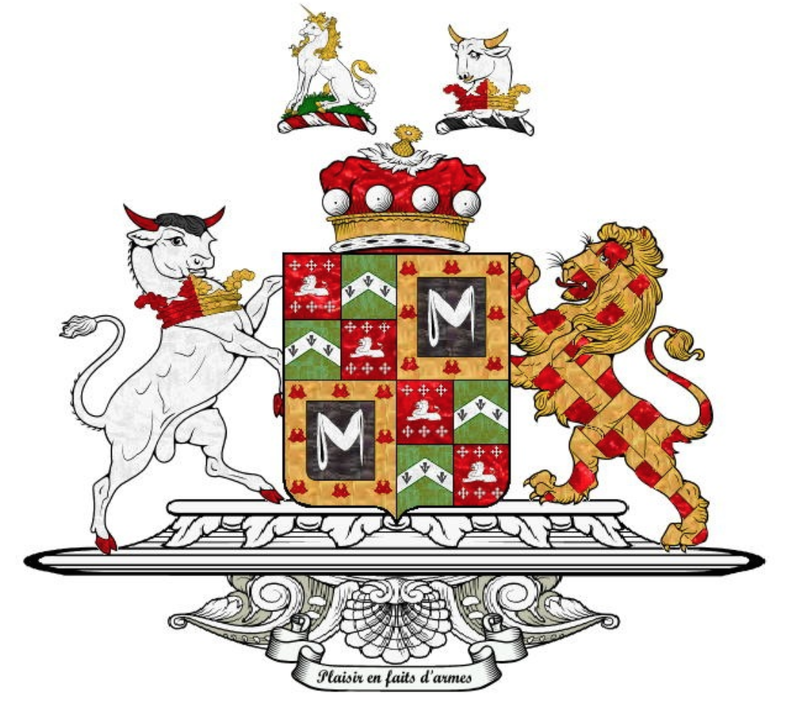 He was the son of Philip Wharton, 4th Baron Wharton and his second wife, Jane Goodwin, only daughter of Colonel Arthur Goodwin of Upper Winchendon, Buckinghamshire, and heiress to the extensive Goodwin estates in Buckinghamshire, including Winchendon, Wooburn, Waddeston, Weston, and other properties. In his long political career he was a Member of Parliament for seventeen years and spearheaded the Whig opposition to King James II’s government, which later developed the two party political system under Queen Anne. Before the Glorious Revolution he was in close contact with a group of army officers conspiring against King James, including his brother Captain Henry Wharton. In 1689 he was sworn of the Privy Council and made Comptroller of the Household by King William III, establishing the link between the royal position and government for the first time, although William is said to have distrusted him. He went out of office in 1702, after the accession of Anne (who disliked him intensely, and took great pleasure in personally taking his staff of office from him), but in 1706, he was created Earl of Wharton and Viscount Winchendon in the Peerage of England. He served as Lord Lieutenant of Ireland 1708–1710. Anne’s dislike of him was partly the product of her dislike for the Whig Junto- the “five tyrannising lords”, which William III had shared to some extent, but far more to his debauched and irreligious character. Even by the standards of Restoration rakes, Wharton was considered a man “void of moral or religious principles”. The most striking charge was that in 1682, when drunk, he had broken into the church in Great Barrington, Gloucestershire, and relieved himself against the communion table and in the pulpit. The story is probably true: certainly in 1705 during a debate on Church matters in the House of Lords Wharton was left speechless when Thomas Osborne, 1st Duke of Leeds directly accused him of it. Despite his faults he has been described as a man of immense charm, a fine public speaker and a “political organiser of genius”. As the dominant politician in Aylesbury, he was partly responsible for the landmark constitutional case of Ashby v White, which established the principle for every wrong there is a remedy. It is rumored that Wharton had taken Dorothy Townshend, née Walpole, as a lover prior to her marraiage. It is possible there is some truth to this as further rumors suggest that her later husband, Charles Townshend, 2nd Viscount Townshend may have either killed her or faked her funeral and hid her away at Raynham Hall. This rumor is based on the alleged infidelity of Dorothy during their marriage. She is also rumored to haunt Raynham, known as the Brown Lady of Raynham Hall. Under George I of England, he returned to favour. 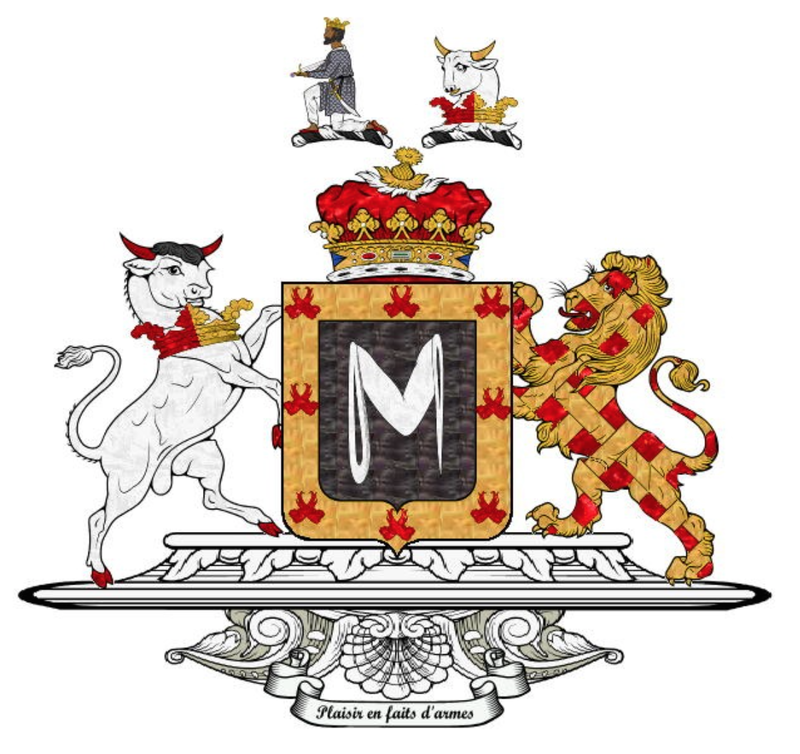 In January 1715, he was created Marquess of Catherlough, Earl of Rathfarnham, and Baron Trim in the Peerage of Ireland, and in February 1715 Marquess of Wharton and Marquess of Malmesbury in the Peerage of Great Britain. When he died in April 1715 he was buried in Upper Winchendon, Buckinghamshire. He is generally credited as author of the original lyrics of Lillibullero, which “rhymed King James out of England”. Wharton married firstly on 16 September 1673 Anne, or Nan, Lee (d 29 October 1685 aged 26), younger daughter of Sir Henry Lee, 3rd Bt. (d. 1659), an elder half-brother of the famous libertine poet John Wilmot, 2nd Earl of Rochester; she had some reputation as a poet and dramatist. They had no issue together. 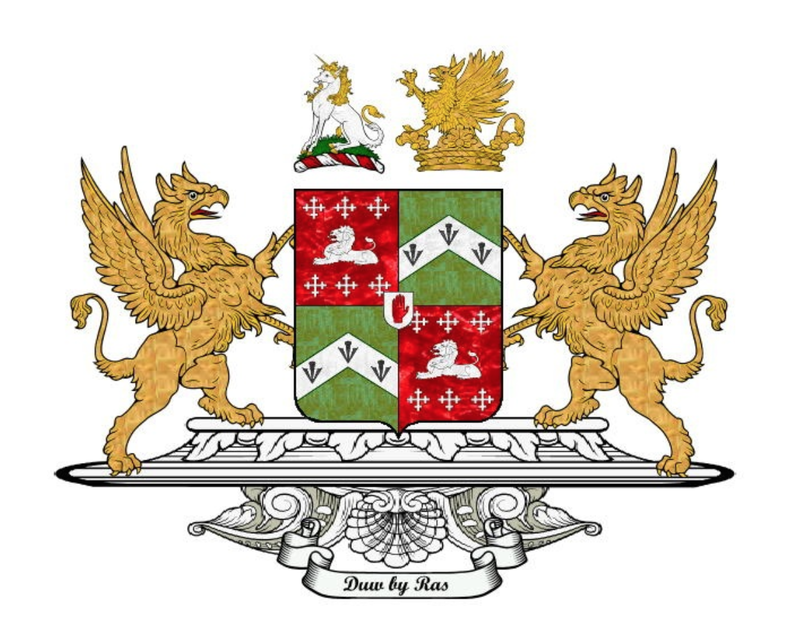 Her sister Eleanora Lee married James Bertie, Lord Norreys; their cousin was Edward Lee, 1st Earl of Lichfield. Although her husband had infected her with syphilis, Anne Wharton left him her fortune. Her grandmother Anne St. John, Countess of Rochester tried to regain her fortune from the Whartons with little effect. He married secondly Lucy Loftus, only daughter and heiress of Adam Loftus, 1st Viscount Lisburne. They had one son Philip Wharton, 1st Duke of Wharton, and two daughters, Lucy Holt and Jane Morice. On his son’s death without heirs, all his titles became extinct, except the Barony which passed to Jane Morice. 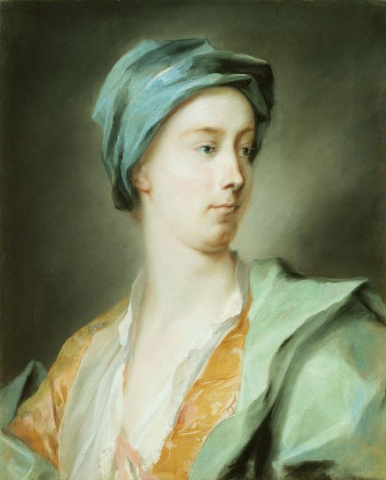 The Duke of Wharton, by Rosalba Carriera, 1718-20. Philip Wharton, 1st Duke of Wharton (21 December 1698 – 31 May 1731) was a powerful Jacobite politician, was one of the few people in English history, and the first since the 15th century, to have been raised to a Dukedomwhilst still a minor and not closely related to the monarch. He was the son of Thomas “Honest Tom” Wharton, the Whig partisan, and his second wife Lucy Loftus. 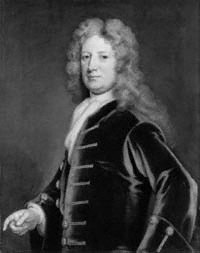 When Thomas died in 1715, Philip, then 16 years old, succeeded him as 2nd Marquess of Wharton and 2nd Marquess of Malmesbury in the Peerage of Great Britain and 2nd Marquess of Catherlough in the Peerage of Ireland. Just a month after he inherited his titles, he eloped with Martha Holmes, the daughter of Major-General Richard Holmes. Wharton did not get control of his father’s extensive estate, for it was put in the care of Philip’s mother and Thomas’s Whig party friends. Thereafter, young Wharton began to travel. He had been raised with an excellent education and prepared for a life as a public speaker, and Wharton was eloquent and witty. He travelled to France and Switzerland with a severeCalvinist tutor whose authority he resented. He met with James Francis Edward Stuart, the “Old Pretender” and son of James II, sometimes known in Europe as the rightful James III, or Prince James, the Prince of Wales (James Francis Edward Stuart; “The Old Pretender” or “The Old Chevalier”; 10 June 1688 – an orphan in 1701, aged 13–1 January 1766) who created him Jacobite Duke of Northumberland in 1716. Wharton then went to Ireland where, at the age of 18, he entered the Irish House of Lords as Marquess Catherlough. When he was 19 years old he was created Duke of Wharton in 1718 by George I in the King’s effort to solidify his support. In 1719, Wharton’s wife gave birth to a son named Thomas, but the baby died in a smallpox epidemic the next year. From that point on, Wharton had little to do with his wife. Wharton turned Jacobite when travelling in 1716, or at least nominally Jacobite. He began signing his name “Philip James Wharton” to indicate his allegiance. Because he was a powerful speaker, an elegant writer, a wealthy (initially) peer, and a man with a title, the new Hanoverians always sought to gain him as an ally, while the old Jacobites were, at least initially, zealous to keep him on their side. Even before his losses in the South Sea Bubble stock market crash of 1720, Wharton collected debts. He was so indebted that he sold his Irish estates and used that money to invest in South Sea Company stock. When the Bubble burst, he lost the staggering sum of £120,000 (in an era when a middle class salary in London might be £200 a year). In response, he hired musicians and a hearse and held a public funeral for the South Sea Company. Wharton began to borrow money from Jacobite bankers and accumulated more debts. In 1719 Wharton is credited with founding the original Hellfire Club. (not related to Dashwood’s Hell-fire Club), which primarily performed parodies of religious rites. He became Grand Master of the Premier Grand Lodge of England in 1723, and was active in the House of Lords in opposition to Robert Walpole. In 1723, he wrote and spoke in favour of the exoneration of Francis Atterbury, the accused Jacobite bishop, although Atterbury’s Jacobitism was superficial. He published The True Briton as a periodical to oppose the rise of Walpole. He was in favour of the Pretender not for religious or nationalist reasons but, he explained, because he was a true Old Whig like his father, whose principles had been betrayed by Walpole and the new non-native royals. His substantive change to Jacobitism occurred in 1725, when Wharton joined Earl Orrery in attacking the Court. He made allies among City politicians, which was valuable to the Jacobites as Jacobitism had previously been associated with Scotland and disaffected country squires. The City had been a Whig stronghold and any erosion in their support would have powerful consequences. Indeed, although Wharton did not benefit from it, much of this would bear fruit in the emergence of the Patriot Whigs a few years later. At the same time, Wharton was £70,000 in debt. Wharton’s debts were impossible for him to overcome. He accepted or sought the position as Jacobite ambassador to the Holy Roman Empire in Vienna in 1725, but the Austrians did not like Wharton, whom they did not consider a satisfactory diplomat. His dissipate lifestyle also offended the more severe Austrians. He then went to Rome, where James gave him the Order of the Garter, which Wharton wore publicly. He moved on to Madrid. Wharton’s wife died in 1726, and he married Maria Theresa O’Neill O’Beirne only three months later. Walpole’s spies were informed of Wharton’s activities and other Jacobites considered him a dangerous person to be near. Additionally, his behaviour was growing more offensive, mainly with drunkenness, but also with inappropriate actions. At the reception for his wedding, he exposed himself to the wedding party (and bride) to show her “what she was to have that night in her Gutts” (cited in Smith). Even Francis Atterbury condemned him. In 1728, Wharton began to help Nathaniel Mist with Mist’s Weekly Journal. He wrote the infamous “Persian Letter” that caused the Walpole ministry to respond violently with arrests and the destruction of the presses. The power of Wharton’s name and eloquence was such that Walpole offered Wharton a pardon and forgiveness of his debts if he were to agree to leave off writing. He also wrote, that year, a powerful piece against the “corruption” of Whig causes under Walpole entitled, “Reasons for Leaving his Native Country.” Edward Young modelled “Lorenzo” in Night Thoughts on Wharton. Alexander Pope referred to Wharton as “the scorn and wonder of our days” – a man “Too rash for thought, for action too refined” (Epistle to Sir Richard Temple). Wharton was soon stealing food from acquaintances and seeking money anywhere he could get it. He sold his title back to George I and took a position as a lieutenant colonel in the Jacobite forces in the Spanish army fighting England. He took up arms, therefore, against his native country, and this warranted a charge of treason in 1729. In the siege at Gibraltar in 1727, Wharton sought to prove that he was not a coward, and so he charged at the head of his men and was wounded in the foot. Before the treason charge, Wharton fitfully attempted a reconciliation with George. He offered to give Walpole’s spies intelligence, but they rejected him as of little value, and he returned to Madrid to live on his army pay alone. When he was insulted by a valet, he caned him and was imprisoned briefly before being banished. In 1730, he renounced James and the Jacobite cause. In advanced stages of alcoholism, he and his wife moved to the Royal Cistercian Abbey of Poblet, in Catalonia, where he died 1 June 1731. His widow returned to London, with the aid of James. When Wharton’s will was proved in court in 1736, she was able to live comfortably in society in London. Wharton’s titles became extinct on his death, other than Baron Wharton which was inherited by his sister Jane Wharton, 7th Baroness Wharton, and revived in 1916 after many years in abeyance. What a wonderful account of such a colourful but repellent man.